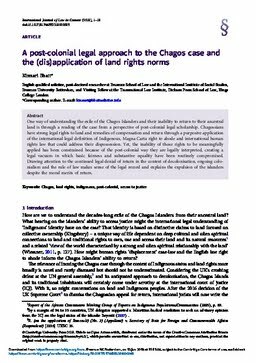 One way of understanding the exile of the Chagos Islanders and their inability to return to their ancestral land is through a reading of the case from a perspective of post-colonial legal scholarship. Chagossians have strong legal rights to land and remedies of compensation and return through a purposive application of the international legal definition of Indigenous, Magna Carta right to abode and international human rights law that could address their dispossession. Yet, the inability of those rights to be meaningfully applied has been constrained because of the post-colonial way they are legally interpreted, creating a legal vacuum in which basic fairness and substantive equality have been routinely compromised. Drawing attention to the continued legal denial of return in the context of decolonisation, ongoing colonialism and the rule of law makes sense of the legal record and explains the expulsion of the islanders despite the moral merits of return.